A coworking chain that prefers to own its real estate has purchased a second building in Denver. Chicago-based Novel Coworking, which already operates at 1630 Welton St. in Denver, paid $40.2 million last week for the 17-story building at 1801 Broadway, according to county records. The building, known as Trinity Place, is 197,753 square feet, making the deal worth $203 a square foot. Tenants include Bank of Colorado, restaurant La Loma, Gunnison Energy and REI Structural. The seller, Velocis Trinity LP, paid $37 million for the building in December 2014. At the time, the Denver Business Journal reported the building was 89 percent leased. As of the sale last week, that figure was 65 percent. The existing vacancy, however, was a major selling point for Novel, which will convert that space into coworking. The existing tenants will remain in the building for the duration of their lease. “As those leases expire, we typically go in and redevelop,” Rogers said. Rogers said other selling points of 1801 Broadway include the high-visibility location, and the fact that all sides of the building have windows, allowing for ample natural light. Novel Coworking has locations in 22 cities across the country, including Boulder and Denver. The company always owns, rather than leases, its locations, which sets it apart from other industry giants like WeWork. “We are the largest owner-operator of coworking space in the country,” said Rogers, adding the firm now controls 2.4 million square feet. Rogers said the model means “there’s more stability in our business model and our pricing” compared to Novel’s competitors. Access to Novel coworking spaces costs $129 a month, with private offices in Denver starting at $579 for a two-person space. For comparison, WeWork’s website on Monday showed hot desk pricing at its Denver locations starting at $720 a month, and two-person offices starting at $1,260 a month, assuming a May move-in. 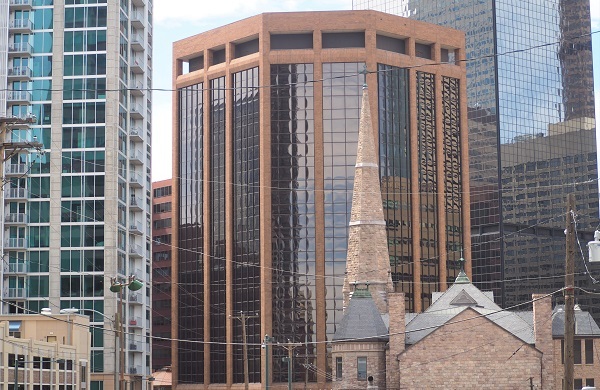 Novel’s existing Denver location at 1630 Welton St. opened in September 2017, three months after the company purchased the 10-story building, Rogers said. 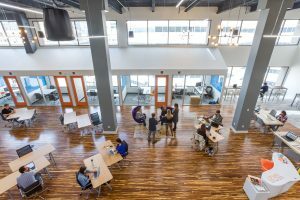 All but about 10,000 square feet of the 125,000-square-foot building is now coworking, after the opening of two floors last month; the remaining space is still leased to other tenants. Rogers said Novel now plans to add a rooftop deck at that building — another benefit of ownership.